I would like you to know about foods in Cebu and also you can feel something through my experiences. My experiences are extremely precious and I would like to share it with you. 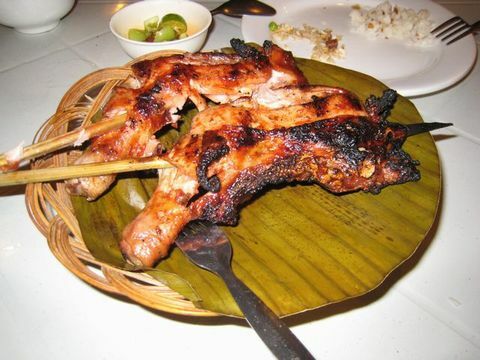 １、Philippines restaurant in Mactan MARIBAGO GRILL Grilled spare rib and chicken. ２、German restaurant in Mactan MB's Everything is delicious & reasonable. 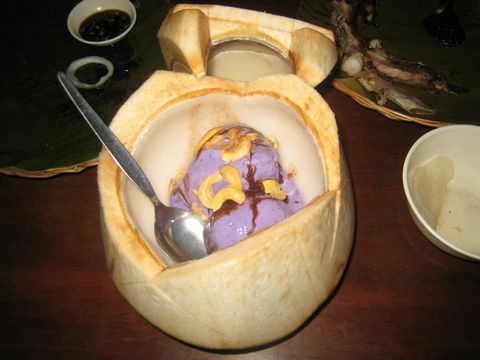 ３、Philippines restaurant in Cebu City CASA VERDE You're satisfied with everything. ４、 Spanish restaurant in MactanHola Espana We can eat good & resonable foods compared to your country. 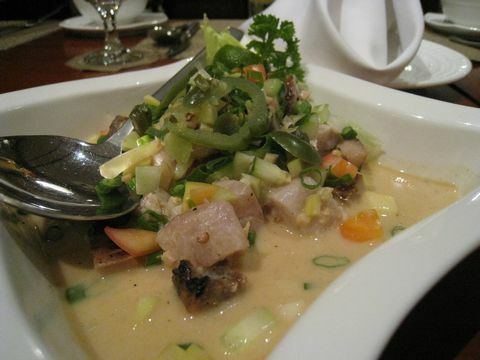 ５、Thai restaurant in Manctan Krua Thai It's better to order Green chicken curry soup. I'm sorry not to reply all your comments for a long time. I wrote this message for visiting my blog and left some comments. Now I'm still busy for doing my business so I can not reply soon after commenting this topic. 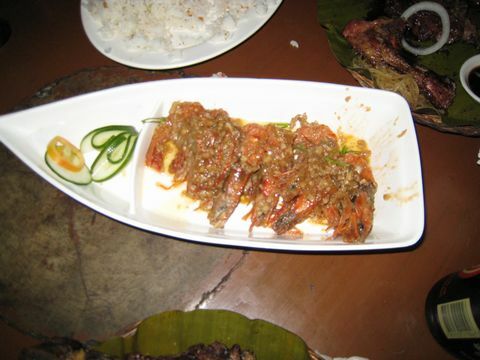 My web-blog is about Cebu island where you can visit , eat foods and have good time. But, I cannot reply all of your comments soon , so wait for my reply without my positive response. Actually I plan to make Website about Cebu island using Wordpress so you can find out something more information through it. When I start it , I'll announce you on this web-blog!! After getting enough time to do it, I'll show you more good information to use Wordpress and Goog Photos. Hope all of you have good time all the time. Cebu island is my second place to go back. 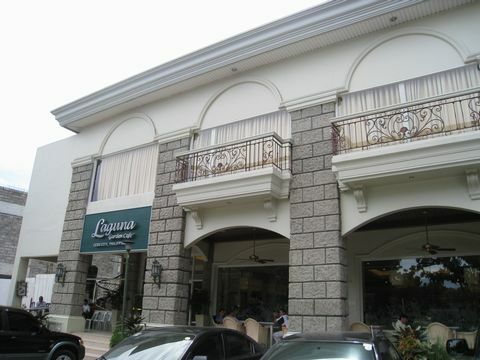 Location : Century Plaza Commercial, Complex Juana, Osmena St. Cebu City, Philippines. 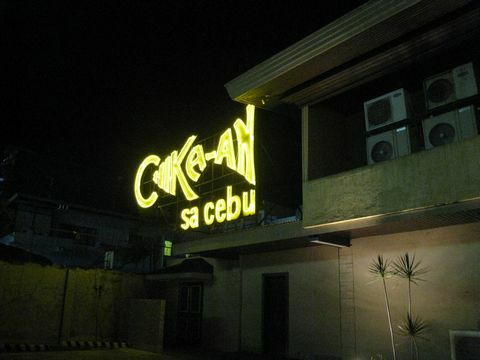 The CHIKA-AN is located on Osmena street near GOLDEN COWRIE which also provides us reasonable Filipino cuisine. If you wanna dine in thie restaurant, it's much better to reserve a table before coming agaist congestion. 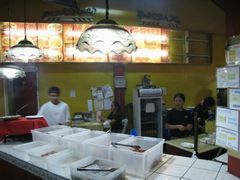 Inside the restaurant which is always crowded during night time. Actually I was invited by my friends for my farewell party at this night. We could enjoy our dinner at this restaurant thanks to my friend who booked a table for us agaisnt congestion. 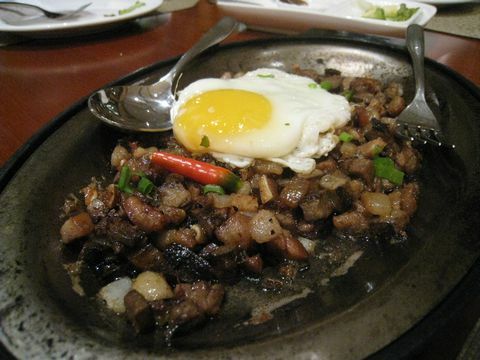 This is SISIG which I can recommend you to order, if you like to eat chopped stir-fried internal organ of Pork. The prices is also really reasonable. 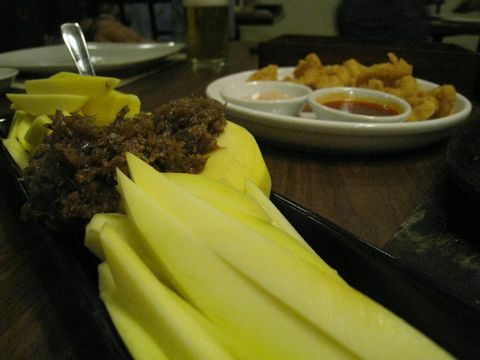 This is GREEN MANGO with BAGOONG which is good for your health, but it's too sour because of Green Mango. It's good to put BAGOONG on a Green Mango when you eat it. 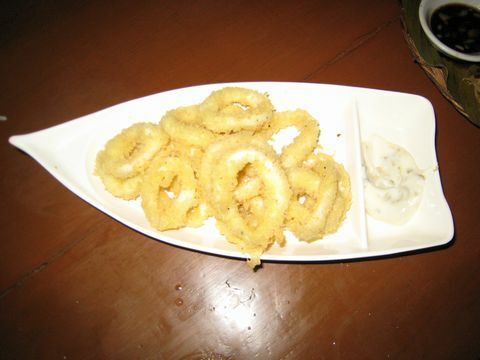 This is CALAMARES which is also well known by Filipino. 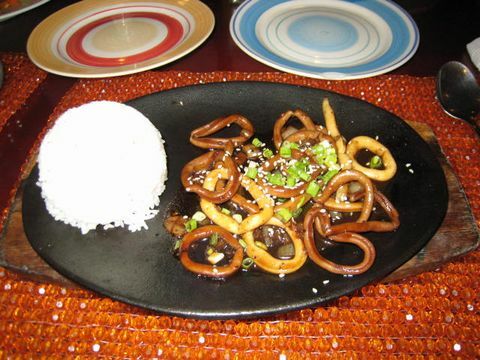 I always order Calamares when I go to Philippines Restaurant because of stable taste. You might wanna order first. 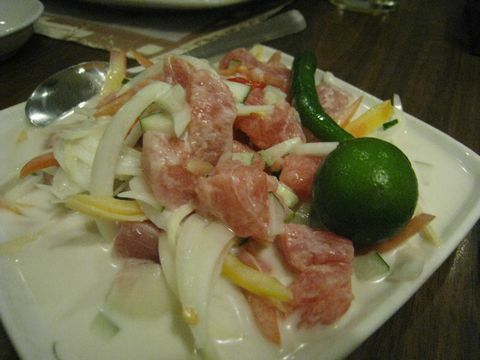 This is KINILAW na Tuna with Pepino which I can recommend you to order if you are women. I mean it's really healthy food among all. But you need to know that this one uses raw fish. This is POCHERO with Beef which is also my recommendation. 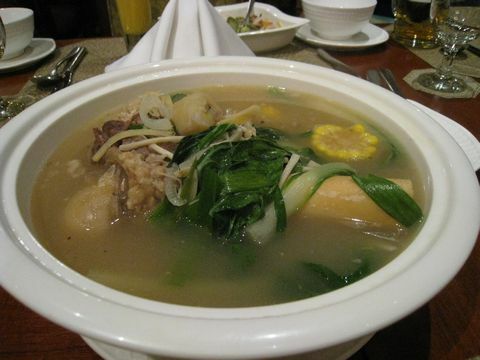 Indeed I like to order it compared to Sinigang Soup which is sour taste, even though famous soup here in Philippines. 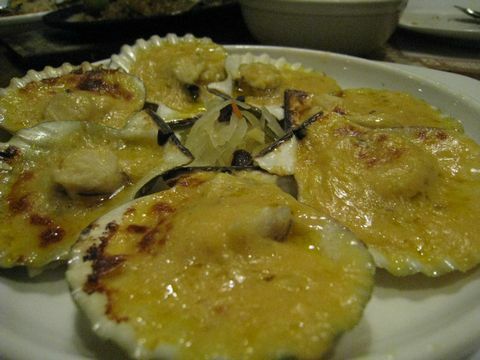 This is Baked Scallop hich is baked with Garlic butter and Cheese. 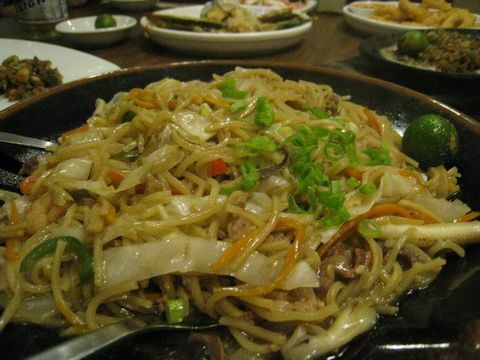 This is Pancit Cusiado which is like noodle, so if you wanna eat this kind of noodle, you just order it. This is Baked Tahong which is also baked with Garlic butter and Cheese. 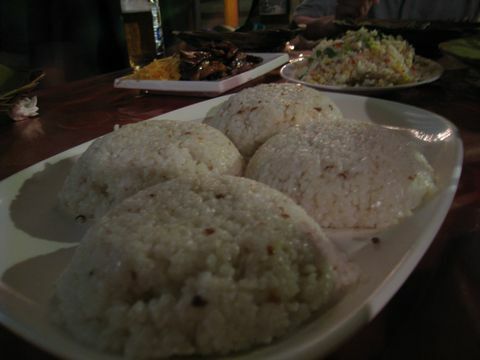 This is Garlic Rice which you can order anywhere in Philippines. This one is good enough to eat for 2 people. 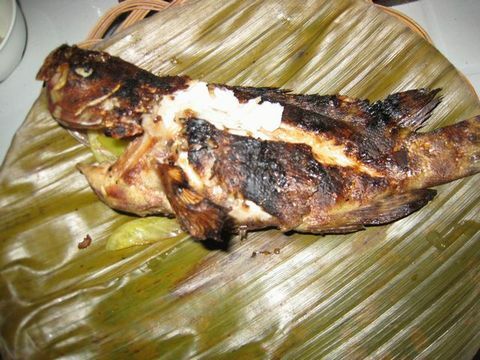 This is Fried Katambak which is just Fried Fish. I'll give you an advice that you need to care about fish bone. 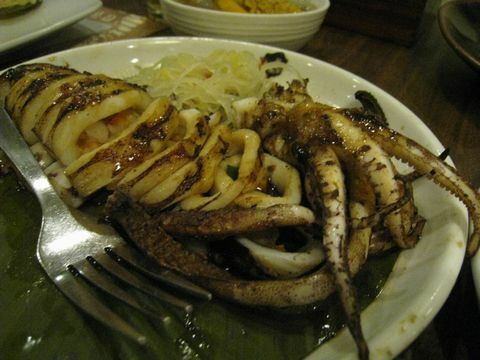 This is Grilled Squid which you can order anywhere. 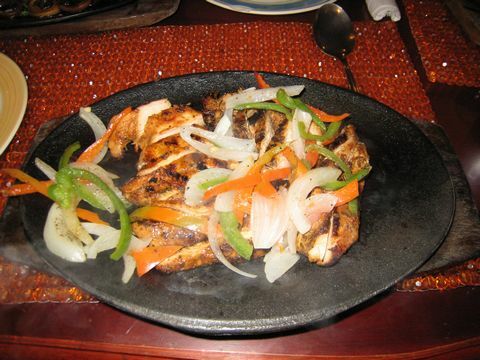 And also you can order another kind of cooking style, Fried, Grilled and Sizzling. 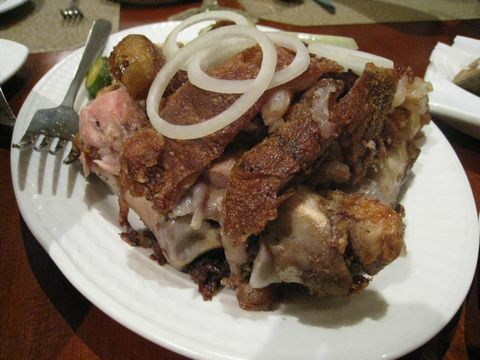 This is Crispy Pata as a small which you can choose the size between small and large, but I think it's ok to order small one which is good enough to order for 5 or 6 people. This is Grilled Pork Belly which I can recommend you to order because of the taste. I like this taste among all menu here in Chika-An. If you wanna eat more delicious one, it's good to visit my favorite restaurant "Maribago Grill" which is located in Maribago, Mactan. 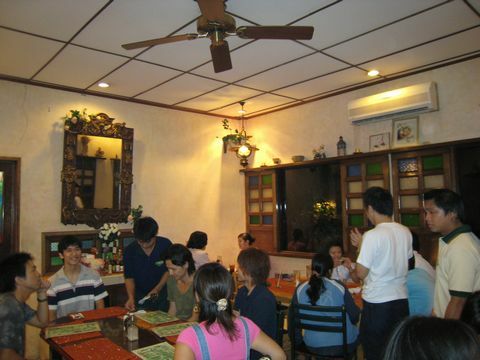 This Restaurant is always crowded, as a result it's advantage to reserve a table before coming here. 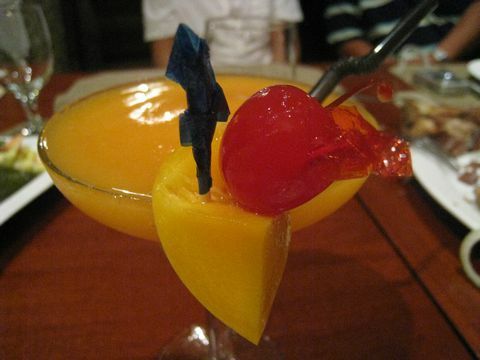 You might miss your dinner at CHIKA-AN without reservation. 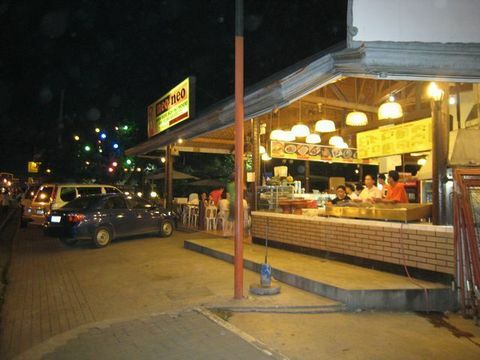 If you missed your dinner, you just visit Golden Cowrie which is located across from this restaurant CHIKA-AN. 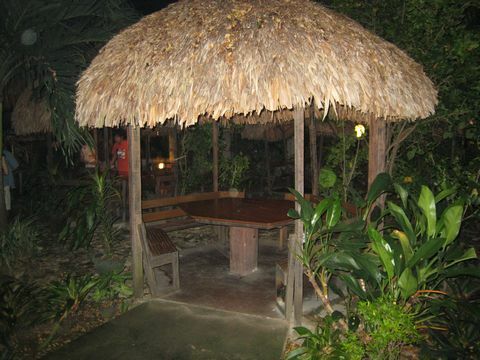 Laguna Garden Cafe Restaurant, Cebu, Philippines. Location : Gareden Row 1, Biliran Road Cebu Business Park Ayala, Cebu City, Philippines. 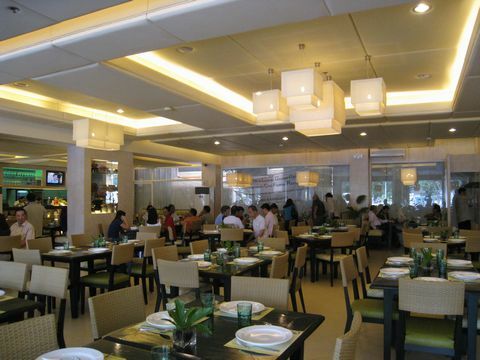 This cleanly restaurant is located near AYALA Shopping Center where we can buy commodities, foods, and for dinner. I used to come here for shopping when I came here in Cebu for studying English. This is inside the restaurant which has really awesome ambience, even though you need to wait for your meal for 30 minutes. Actually they provide you delicious foods, that's their good point, but you need to have patience about waiting time. I heard that one Japanese businessman was angry before. You know what I mean, it happened because of our common sense, but here in Philippines, we need to follow their custom. 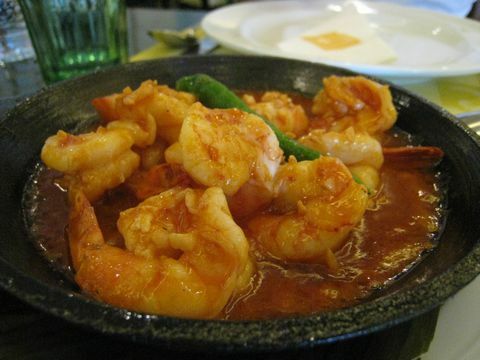 This is GAMBAS which is grilled shrimp with a little bit spicy garlic sause on a hot plate. 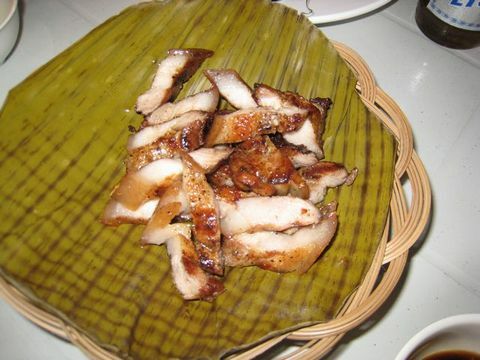 This is PANDON CHICKEN which is well as a savory food in Philippines. 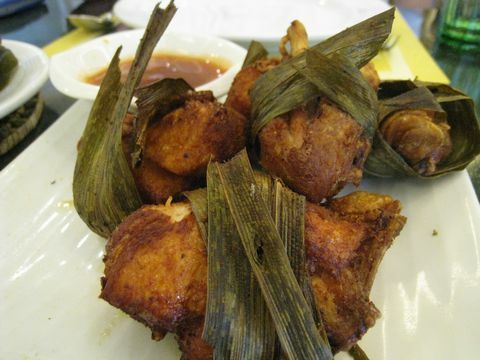 I like this savory Pandon Chicken. I mean, it's much better to order when you come here for dinner after shopping. 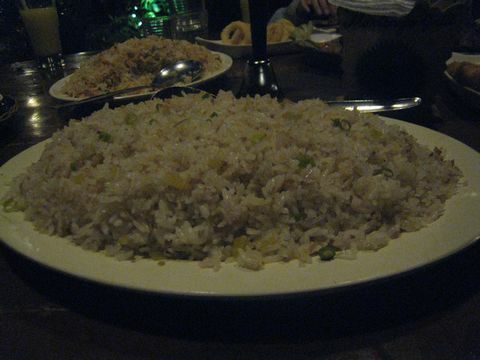 This is SHANGHAI RICE which is good enough to order for 4 people. This is similar to Fried Rice, but it has savory shrimp taste. This is like Noodle which is also famous to eat in Philippines, even though I forgot that menu's name...hahaha, sorry....I'll show you exact name soon. I can recommend you to come here for midday dinner after shopping in AYALA, if you are able to wait your order over 30 minutes during lunch time. I mean you might need to wait for it for over an hour during dinner time. It's much better to come here during day time against congestion. Location : Wilson St., Lahug, Cebu City. This restaurant is located on Wilson St.,Lahug near JY Square. It was my first time to come here. Before going inside this restaurant, I was worried about the prices because of ambience from the outside building. 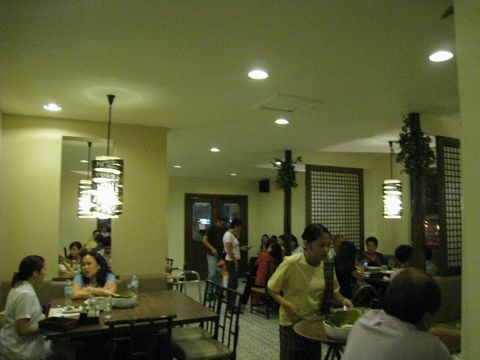 This is inside PINO restaurant which also has amazing atmosphere, so you'll feel something from them. 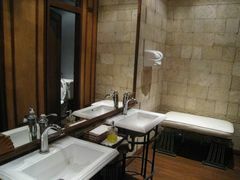 These are about rest room which also keeps clean all the time. I'm sorry that I didn't taste this dish, so I can't comment somthing about it. I think it's kind a pickled slice vegetable with vinegar, but I'm not sure. 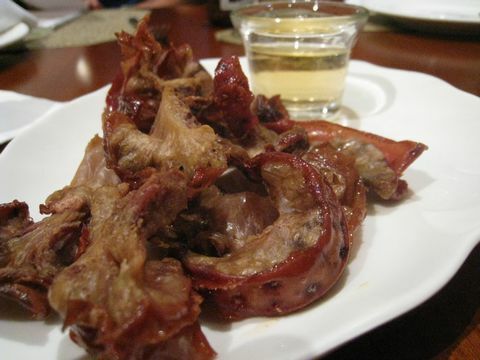 This is Chicharon Bulaclak which is the classic Filipino crackler, dried pork is deep fried making it pop to look like a flower(Bulaclak). It's good to taste with vinegar. 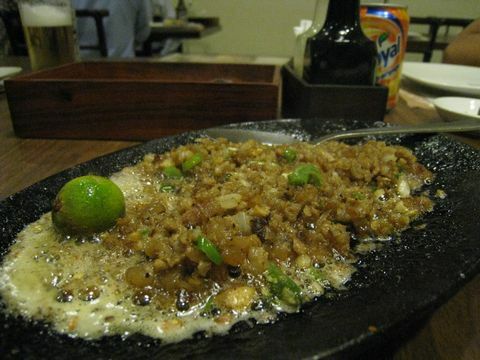 This is also famous to order here in Philippines Sisig which is originated in Pampanga, a province in Central Luzon, A platter of chopped pork cooked with chili, ginger, onions and served sizzling on a hot plate. This is Kilawing Malasugue/tuna which is a platter of fresh, thick, and juicy slices of malasugue and tuna (fish caught off the Visayan seas) allowed to cook in a strong vinegar mix. I like this kind of salad because of healthy food, even though it's Philippines dish. 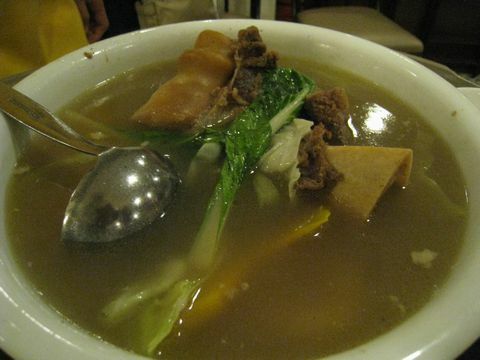 This is Bulalo which is originated in Barangas, a province in southern Luzon. Soup based on the extract beef knuckles that have been simmered for 1 hour. I like this taste compared to Sinigang soup which is a quite sour. 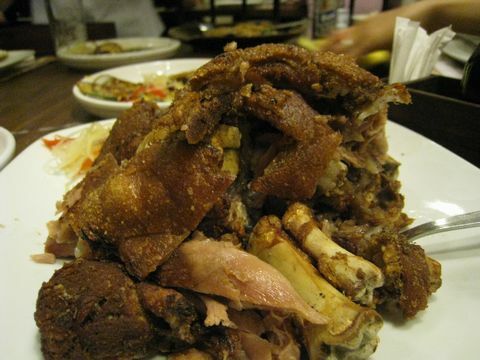 This is Crispy Pata which is deep fried whole pata (pork knuckle) cooked to perfection so that the skin is crisp and the meat so tender. Dinners may choose to have the deboned or the regular boned serving. 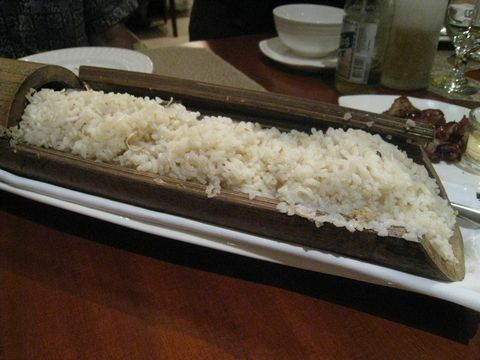 This is Bamboo Rice which is cooked in Bamboo. I like this kind of style which is like Japanese style to use nature things to make it savory. 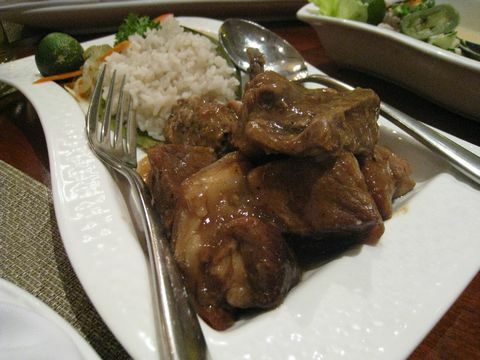 This is Chicken-Pork Adobo which is PINO's version of the Filipino dish. Chcken and Pork simmered with chicken liver in a sauce of soy-sauce, vinegar and garlic. 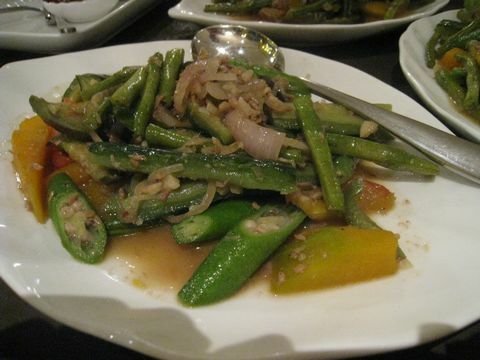 This is Pinakbet which is the vegetable stew of the Ilocos, a region in Northern Philippines. It's a mixture of pork, ampalaya (bitter gourd), eggplant, sqwash, string beans. 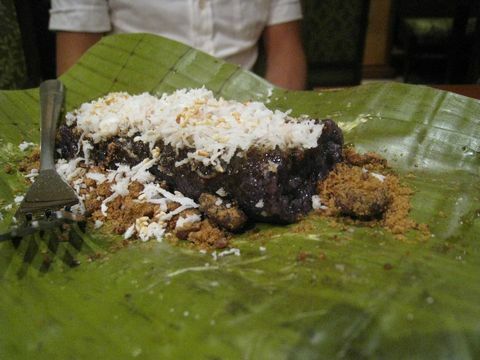 Served with a topping of chopped bagnet, the Ilocano cracker. This is Bibingkang Cebu which is Bibinkang, the Philippines rice cake, topped with slices of salted egg and quesong puti (local white cheese with a salty flavor). It's kind a dessert so it's not so salty. This is a fashionable cocktail, so if you like this kind of liquor. You just try to order, but I'd prefer to drink beer especially SMB and SML because of I'M a beer lover. 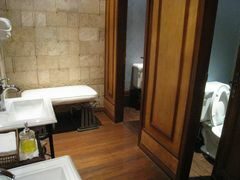 This place is really gorgeous because of the inside ambience, but not so expensive. Actually the PINO provides us luxurious atmosphere and reasonable prices, so I can recommend you to dine in thie restaurant PINO. 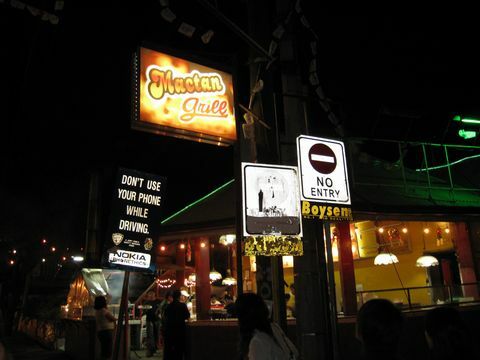 This is "Mactan Grill" where you can have grilled seafood, chicken, pork, and also soup. The place provides us delicious and reasonable meals. This is inside the restaurant and you can choose where you want to have your meal between 1F and 2F. If you visit here I can recommend you to dine in this place especially weekend as a result you'll have a chance to spend your time with live-band music. Left one is where you need to ask them your order first at this counter. 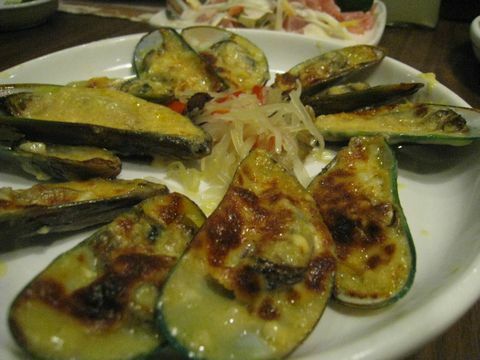 You can choose some foods by yourself and need to tell them how to ccok like grilled, sizzling. If you don't know the way to ccok you just ask them their recommend style. Right one is the cooking place especially for grill foods. 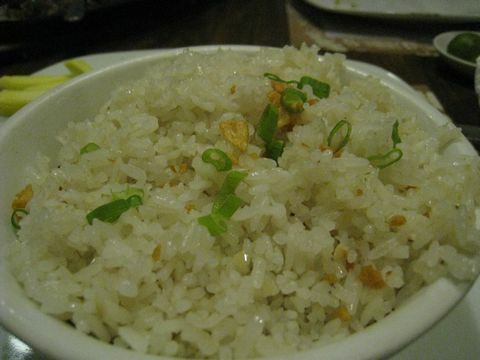 This is Garlic Rice which is terrific famous to order here in Philippines. 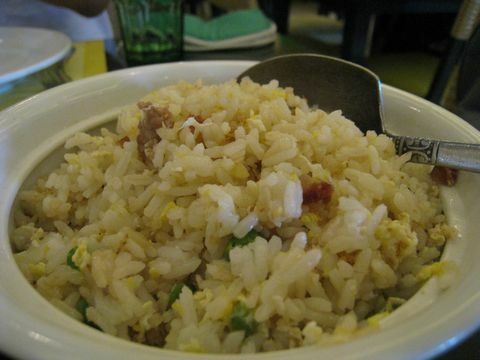 In my opinion I'd like to order Fried Rice better than this one because of irregular taste. One time it was really delicious but next time was not good. 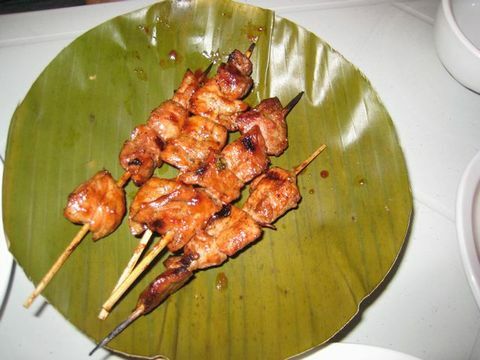 This is "Skewered grilled chicken" which I can recommend you to order for number of you. It's delicious without some sauce. This is Grilled Pork Berry which is chopped after ordering and also delicious and reasonable. 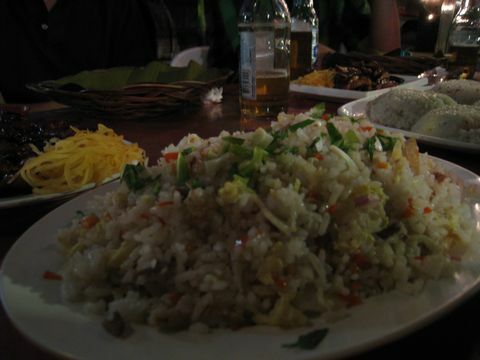 This is Fried Rice which I can recommend you to have it because of taste and they always provides us this one really deliciously. This is Grilled Pork which is also delicious, but it's too hard for you to eat this so I can recommend you to have it by your hand. 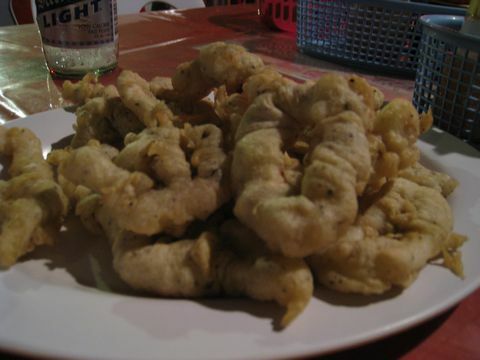 This is "Calamares" which is common to have this one here in Philippines amd also tasty. If you wanna taste it, it's too easy for you to find it many restaurants. 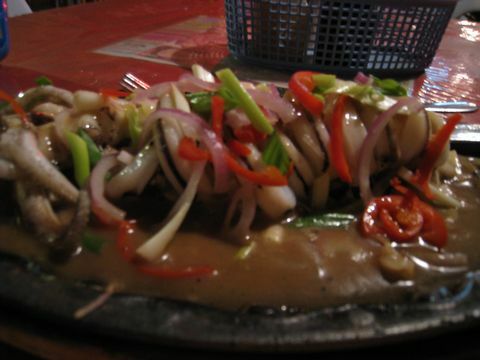 This is Sizziling Squid which is also common to order here in Cebu. I really recommend you to order this one because of taste is terrific nice. 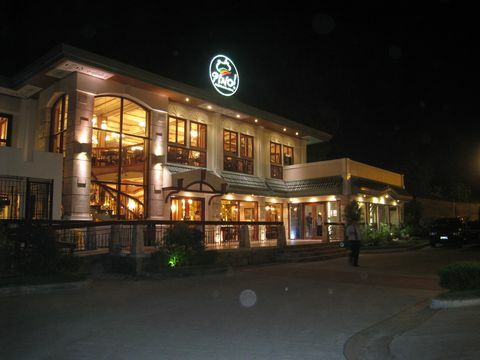 Other restaurants also provides the same one, but especially this restauran is my best!! 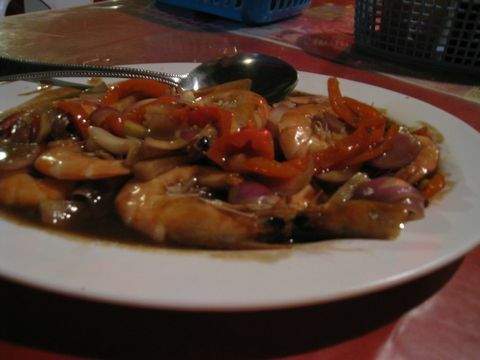 This is "Stir Fried Shrimp with oyster sauce" which my friend recommended to order. It was ok and also you can eat it with its shell. Comments & Advices : Mactan Grill provides us terrific delicious meals and reasonable prices, I'm sure you'll be satisfied with foods and especially prices. They always supply us local prices as a result you can enjoy your time at this place. I also recommend you to dine in Neoneo which is located near this restaurnt. 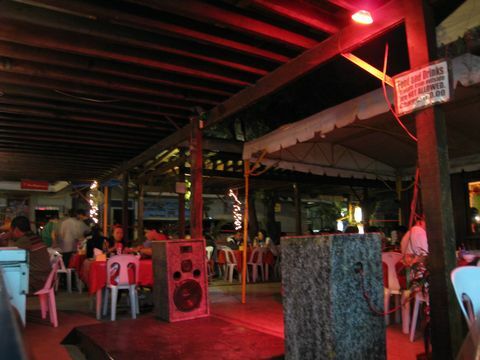 neoneo where you can dine genuine local taste here in Philippines and also reasonable prices. When you visit this restaurant you need to choose what you want to dine first at their counter. 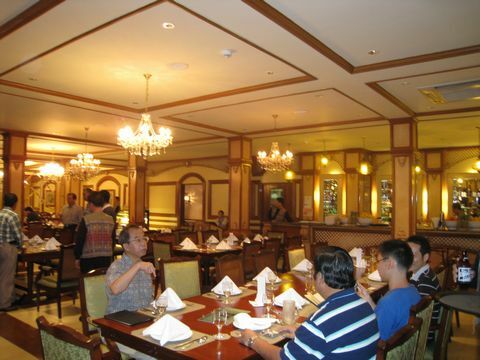 This is inside the restaurant which has a lot of table and also you can see many customers. You just wait for your meals after ordering at your table. 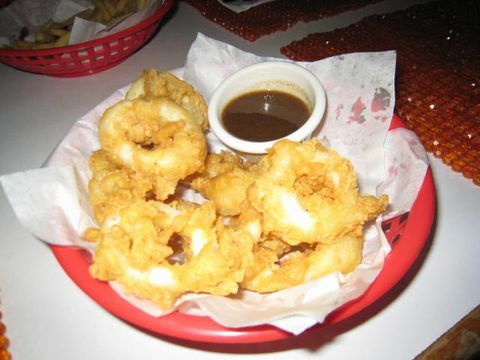 This is Calamares which is hot(in favor) to have it here in Philippines besides it is really reasonable. I would like you to order it if you like fried squid and also taste. 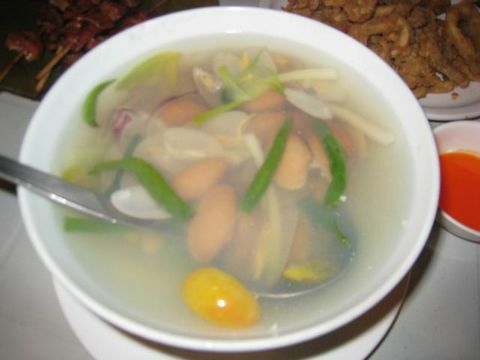 This is Clam Sour soup which has of course clams, vegetables and ginger. It's good enough for 4 or 5 people. 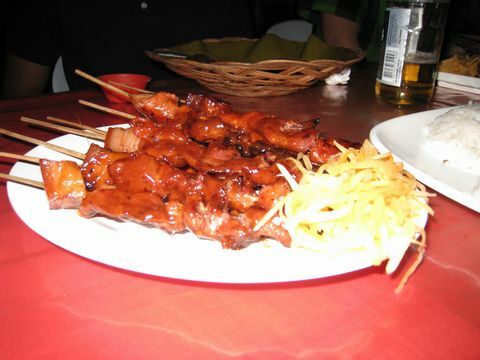 This is Skewered Grilled Chicken which is also really reasonable prices and delicious. It's much better to order it if you like. 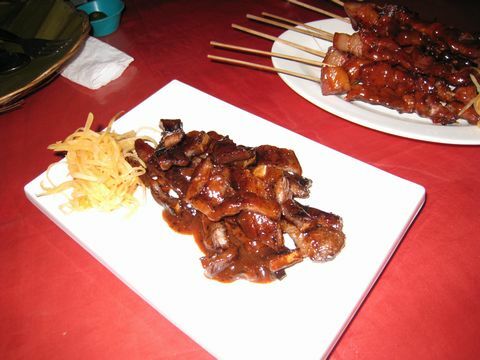 This is Grilled Pork which is a reasonable prices and delicious besides you can share it with your company. This is Sizziling Squid with spicy which you can have it with heated plate and you should not touch it of course you'll get burn. There is one problem that it is hard for you to share because, it doesn' cut perfectly so you have to cut by yourself by your spoon and fork or you just ask staff to cut again hahaha.. 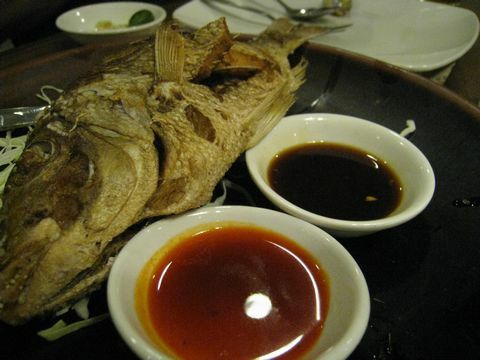 This is Grilled Lapu-lapu which is tremendously famous here in Philippines and also high class fish. The taste is terrific delicious so you'll be satisfied by this taste. You can select how to cook so it's better to ask staff what's on special today. Prices : It depends on the weight. 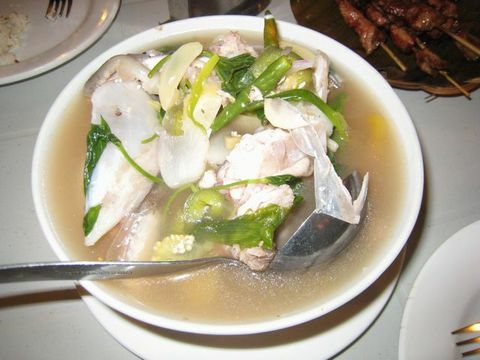 This is Lapu-lapu soup which is also delicious because of Lapu-lapu fish, the fish is terrific capable to have amazing flavor and taste.You can enjoy your dining. This is Grilled Chicken which is also delicious and reasonable so I can recommend you to dine this flavor. 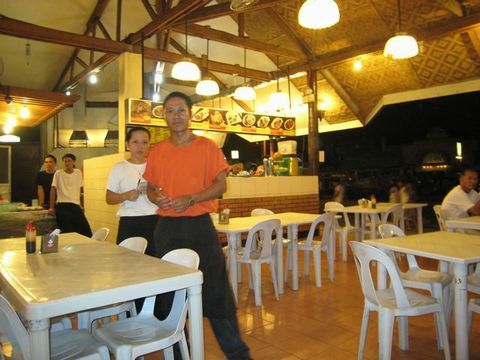 Comments : I often come here for dining because of the reasonable prices and taste. I'm sure you'll be satisfied by everything furthermore ; you can order some alcohol as a local prices if you like it. Everything is reasonable, furthermore the prices that it depends on the weight so I also don't know about exact prices. I'm sure, you don't need to pay a big amount especially here in neoneo. Advices : It's much better to come here with your company as a result you can share them and also to taste a lot. 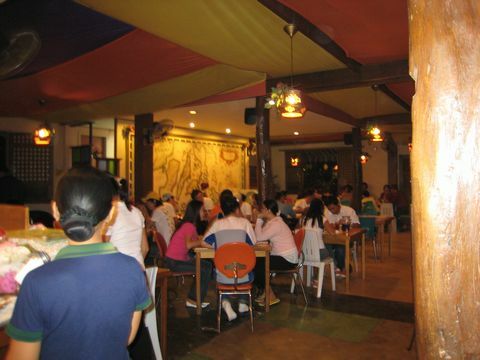 CASA VERDE is located between F.RAMOS street and JONES Avenue. When you lost the way to CASA VERDE, you just ask someone around here. The restaurant is always full with many people who love to dine here even on weekday, so it's really hard for you to dine at this restaurant especially during the weekends. We dined inside the room this time, but it's much better to have a table outside. If you use this room, it's much better to avoid the center table because of air-conditioner. It's really cold. 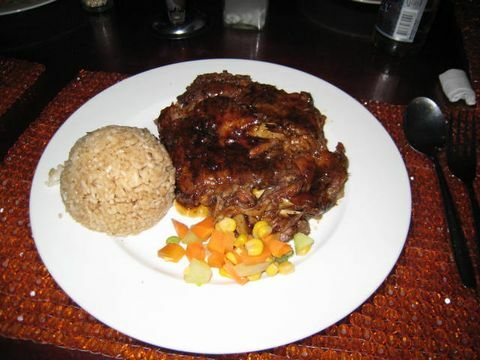 This is Brian's Baby Back Ribs with rice. 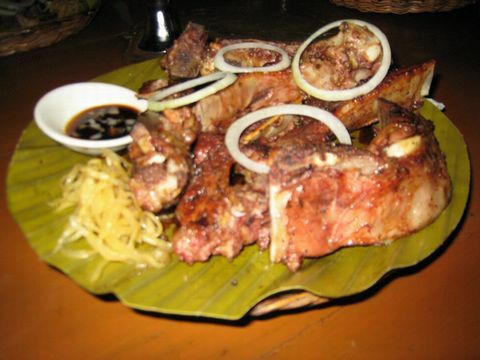 The taste is just ok, I'd prefer to eat this kind of food at MARIBAGO GRILL "Grilled Spareribs"
You can eat more delicious food there especially Grilled Spareribs. This is Salisbury Steak which is really delicious and also reasonable prices. I can recommed you to order it so you'll have a satisfaction. You don't waste your money if you order this one I'm sure. 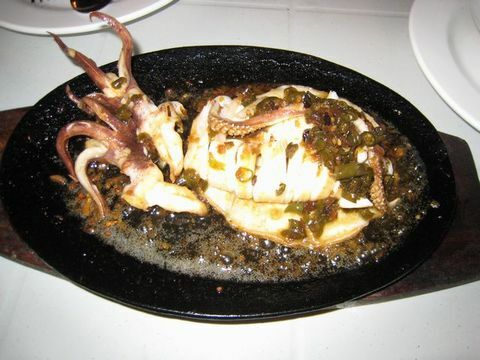 This is Sizzling Squid which is common to eat here in Philippines, but it's better to order this one at AA BBQ, NEONEO. 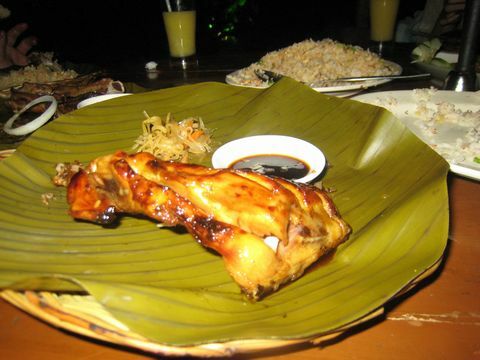 This is Raffitas with Chiken and also you can choose the side-dish among Chicken, Beef and Combo. Prices : it depends on the side-dish. 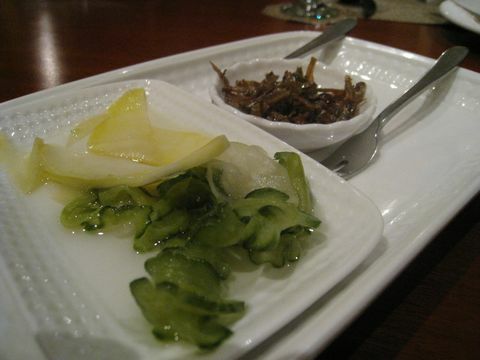 This is Raffitas which is used for three kinds of side dishes with some vegetables, cheese and souce. 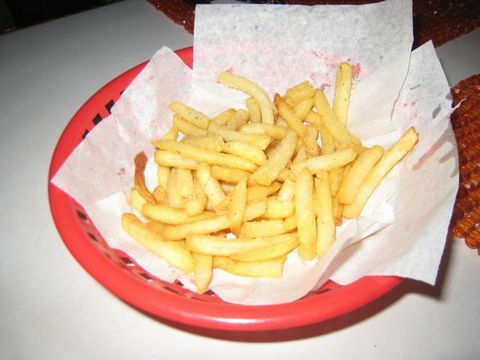 This is French Fries which we love and also good for your children if you have. I can recommend you to order this one because of the prices. Can you imagine the prices, it's amazing. This is Caramare which is like a Fried Squid. This one is also delicious. Prices : I'm sorry that I forgot to note the prices. 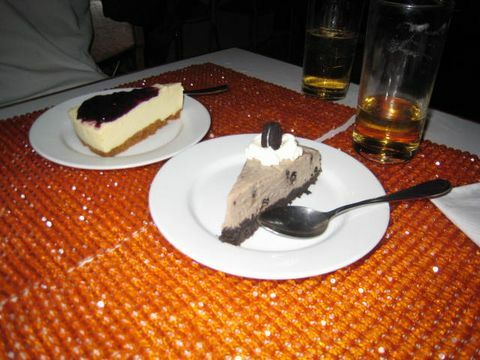 These are desserts "Blueberry Cheese cake" and "Oreo Cheese cake" which are good to order after your meals. Prices : 56pesos=Oreo cheese cake. Comments : Everything is extremely reasonable compared to another restaurants so I can recommend you to visit here. You should come here if you visit Cebu. 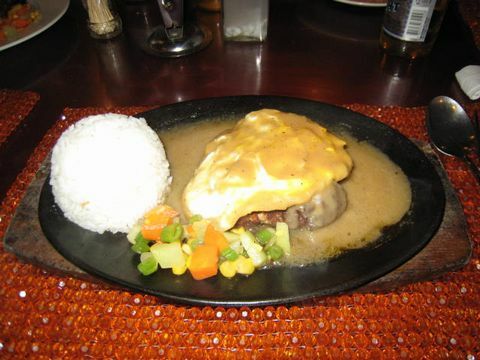 It's much better to order "Salisbury Steak" like hamburger steak with sunny side up egg. You'll be surprised the taste and the prices. Location : Bagumbayan, Maribago, Lapu-lapu City. 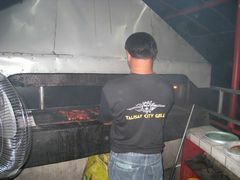 MARIBAGO GRILL is located in MARIBAGO, Mactan Lapu-laou City. 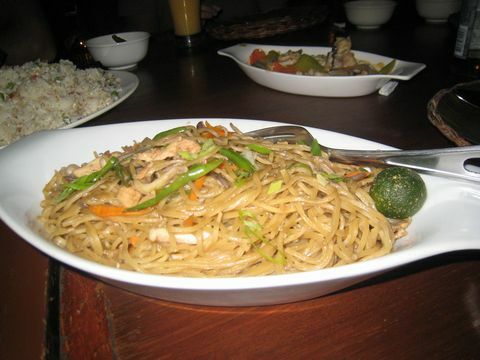 This is similar to Green papaya which is also Philippine restaurant in MARIBAGO. There are many cabins where we dine in with your friends. You are able to feel something because of the good atmosphere. 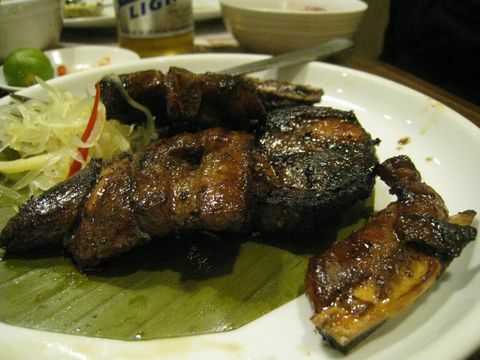 I can recommend you to order " Grilled spareribs"which taste is really delicious compared to others. 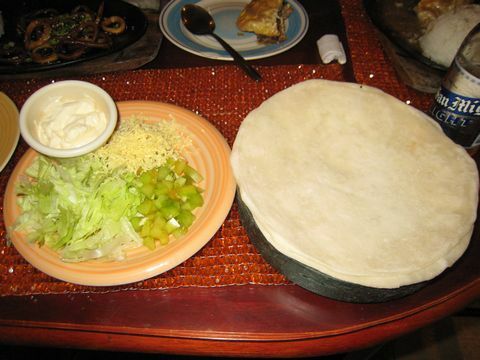 The restaurant provides really delicious and also reasonable prices. If you don't wanna order it you'll regret I'm sure. This is " Garlic Shrimp"which is also delicious. It is stir-fried shurimp with Garlic sweet sauce. It has three kinds of size "S" "M" "L"
Prices : it depends on the size. 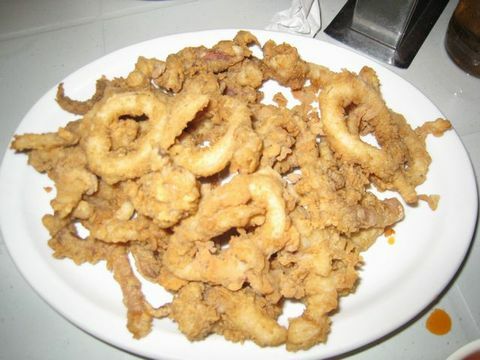 This is " Calamares". 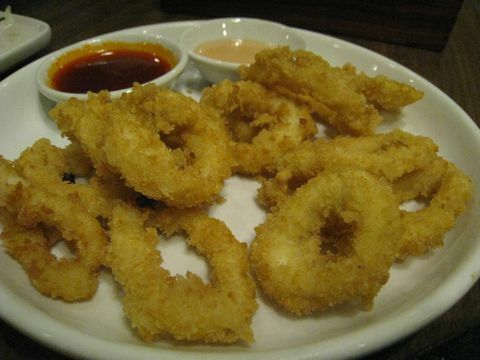 It's common to eat this kind of food which is like Fried Squid. We can eat the same food everywhere in Philippines. 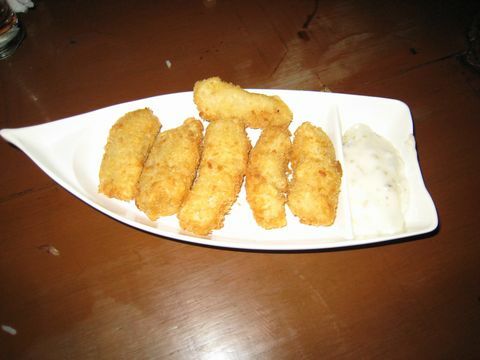 This is " Fish Fillet" which is also delicious. you can share it with your friends. 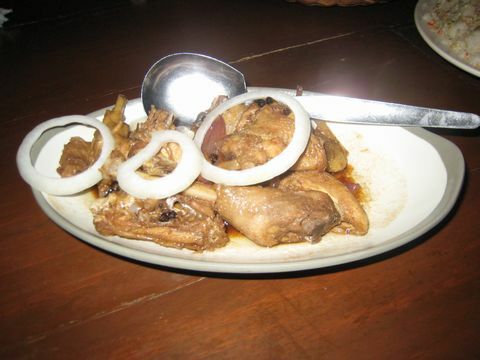 This is "Native Chicken adobo ". It's like a boiled chicken with soy sauce. 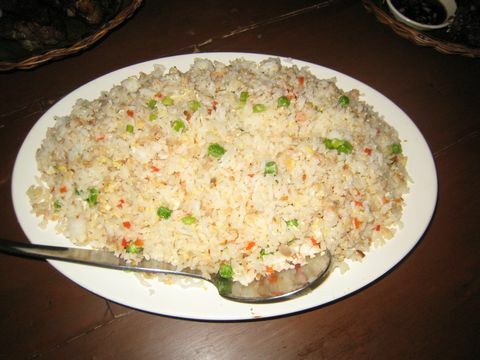 This is " Fried Rice"which is good enough for three or four people. Don't order a lot even though it is reasonable. It's better to share it for 3 or 4 people. This is " Bagoong Rice"which is also good enough for 3 or 4 people and it has shrimp flavor. I like it so you'll like it too. This is " Grilled Chicken with Rice"which is soft chicken with sweet sauce. I want you to order this dish without rice. If you already order Fried, Bagoong rice you don't need to have some rice so it's better to ask their staff without rice. 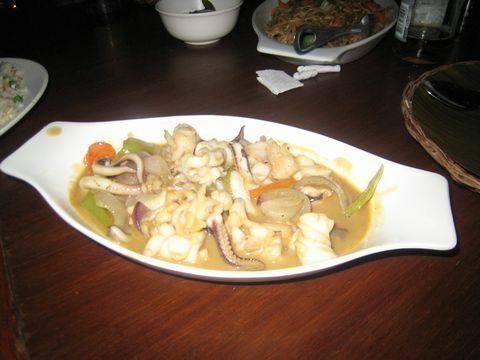 This is Sauteed Squid which is also delicious and good for your health. 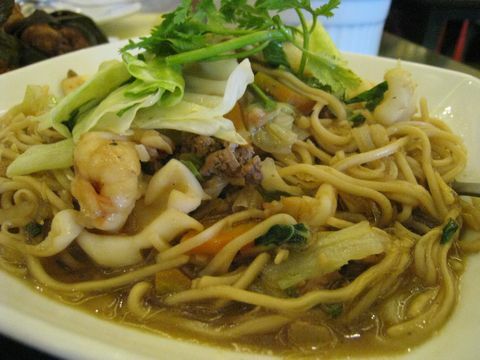 This is Canton which is like Chinese noodle, but not so delicious for me that' why I can't recommend you to order it. This is Maribago dessert which has coconut's sap, 2 scoop of ice cream, cashew nuts and with chocolate souce. It's good for especially kids, girls, and women. 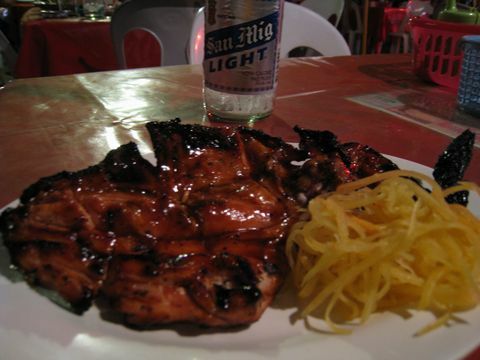 Comments : MARIBAGO GRILL provides us delicious meals so you can enjoy your dinner. It's much better to order my recommend meals and you'll save your money ; furthermore you'll have delicious foods. 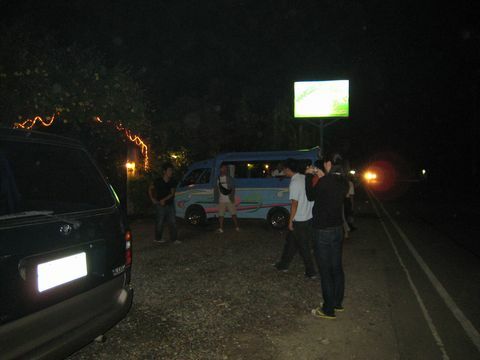 Advices : Don't walk around Maribago alone especially at night time(after 9 pm), otherwise you'll have some trouble. Be careful especially someone who sometimes try to sell drugs and try to sell prostitutes. You should know here is not your hometown especially tourists. This site has registered in Yahoo Category! !